The Oriental Orthodox Concelebration of the Divine Liturgy (Holy Qurbono) (which includes the Syriac Orthodox Church, Coptic Orthodox Church, Armenian Orthodox Church & the Ethiopian Orthodox Church) hosted by the Coptic Orthodox Church will be held at 9:00am on November 19, 2011 at the Archangel Michael & St. Mena Coptic Orthodox Church, 4095 Amboy Rd, Staten Island, New York 10308. All faithful are invited to attend! Attached photos is the Annual Oriental Orthodox Concelebration of the Divine Liturgy held on June 12th, 2010 at St. Mark’s Syriac Orthodox Cathedral, Teaneck, New Jersey. The Liturgy was celebrated last year according to the ancient rites of the Ethiopian Orthodox Tewahido Church, presided by H.E. Archbishop Abuna Zecharias, Primate of the Ethiopian Orthodox Tewahido Church Archdiocese of North- Eastern U.S.A. 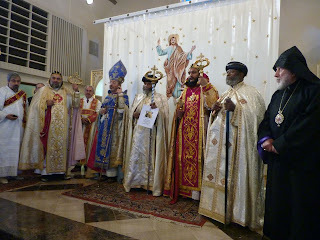 Participating in the Divine Liturgy also were the following Hierarchs: His Eminence Archbishop Khajag Barsamian, Primate of the Eastern Diocese of the Armenian Orthodox Church in America, His Eminence Archbishop Mor Titus Yeldho of the Malankara Archdiocese of the Syrian Orthodox Church in North America, His Eminence Archbishop Mor Cyril Aphrem Karim of the Syrian Orthodox Church for the Eastern USA. Present also were the Ethiopian Orthodox Archbishop of Trinidad, His Eminence Abuna Thaddaius and the retired Armenian Archbishop, His Eminence Yeghishe Gizirian. His Eminence His Grace Bishop David of the Coptic Orthodox Church was unable to participate due to his travel overseas. The Liturgy was served by several priests and deacons from the sister Oriental Orthodox Churches. A big crowd of parishioners from the Ethiopian Orthodox Church showed up with their choir and their traditional drums.